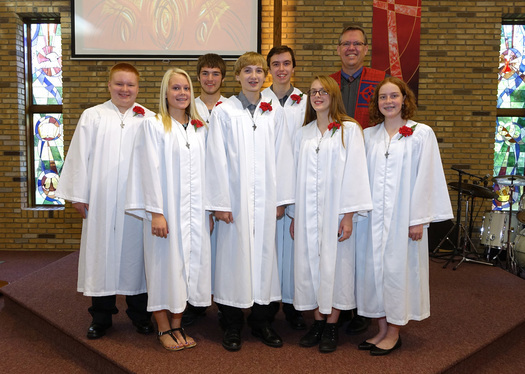 Confirmation at Buffalo UMC includes students in grades 7 and 8 in a program providing Christian education, fellowship, and mentoring with adult faith partners. Parents provide a pivotal support role not only for their own students, but for the entire ministry by seeing that their students are able to fulfill the commitments to the program. Parents may also provide occasional snacks, help cook a meal, chaperone a fun night and/or provide transportation to a retreat or mission event. 7th and 8th graders gather every Wednesday from September through May from 6:00-7:30 pm. Some nights are Focus Nights (class), some are Fun Nights (games and fellowship), and some are Faith Nights (supper with adult faith partners). It’s nice to mix things up a bit! The students are also expected to attend worship and complete worship notes and participate in some mission or service projects as part of the confirmation program. Please call the church for a registration packet if you know of a student who may be interested in our program. Students beyond 8th grade who are new to the community are invited to join our senior high youth ministry. ​Lose your calendar of confirmation events? Click here!